Wash the meat and drain all water. Mix all the mutton ingredients except ghee and green chilies. Heat a pan and add mutton mixture. Cover and cook on medium heat for 40 minutes or cook the mutton as it turns soft. Stir occasionally. Now add whole green chilies and ghee. Cover and cook for 5 minutes. Make sure the mixture is not watery. Mix turmeric, salt and red chili powder with the potatoes. Heat 1 cup oil on high heat in a pan and dip fry the potatoes for 10 min. Heat oil in a dip pan and add bay leaves, shahi jeera, green chilies, cinnamon stick and cardamom. Stir constantly. Add rice and Stir for 3-4 minutes till the rice becomes opaque and you can smell the aroma. Add 5 cup hot water, ginger paste and salt. Stir for a minute. Cover and cook for 2 min on high heat. Open the lid and stir well. Now cover the pan and cook for 18 minutes in low heat or until 80 % done. Mix well the powder biriyani masala. Mix well the liquid masala. Now take a pan and spread 1/3 cooked rice and 1/2fried potatoes. 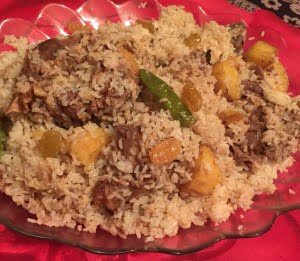 Spread 1/3 powder biriyani masala and 1/2 cooked mutton with juice. Spread little bit liquid masala and 1 tbsp ghee. Again spread 1/3 cooked rice and repeat the process. Finally spread 1/3 rice and spread some powder biriyani masala. Cover the lid and cook for 10 minutes on low heat.